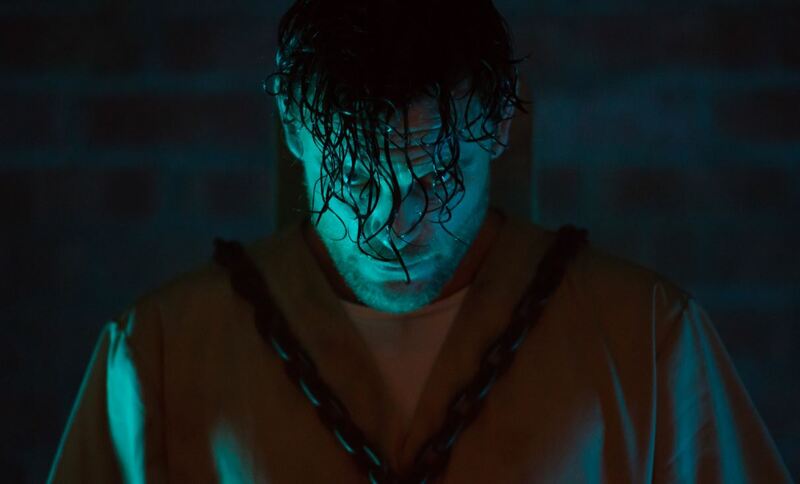 Black Site Review: Fun sci fi horror – AiPT! ‘Black Site’ is obviously inspired by horror films of the 1980s. Many horror fans consider the 1980s a golden era of the genre. Unsurprisingly, there are many movies that look to the decade for inspiration. While 2018’s Black Site is obviously inspired by horror films of the decade, it also draws from science fiction, action movies, and even fantasy. It is an interesting combination that can be fun but also seems unnecessary at times. From Epic Pictures and DREAD Black Site, is about an agency that has protected humankind against the Elder Gods. The titular site is a location where these Elder Gods are researched, questionsed, and eventually sent back to their own dimension. The installation uses wards that prevent gunfire. It is certainly an interesting premise. The movie opens with a computerized crawl and synth music that would fit perfectly in the 80s. The music continues throughout the movie. There are other nods to the 80s like silly one liners. The film also has a mismatched buddy cop sub plot. In a nice touch, the credits are very reminiscent of the 1980s, though they may be a little too like Stranger Things for some. The opening is confusing. There is text that seems to hint that it has been an ages long battle between humankind and the Elder Gods. Afterwards, there is narration that mentions events of 1926 that seem to suggest this was the first confrontation. In the grand scheme of things it does not mean anything, but it takes a little away from the story when the lore seems cobbled together. Especially when one of the main characters later starts talking in terms of eons. The performances are up and down. Kris Johnson is great in his role as Erebus. The part calls for a wider range of emotions than would be expected from an eons old creature. Johnson nails them all perfectly. He is appropriately scary and adds wisdom to the part. Learning more about the character even adds sadness. Johnson’s performance is the highlight. The rest of the cast is not as consistent. Many of the lines are delivered in a flat manner that does not fit what is happening. Many lines are more read than they are spoken. The worst of which are the film’s many quips. In all fairness to the cast, this may be the reason behind the poor delivery. Many of the jokes are very bad. On the other hand, better performances would have a better chance of making the jokes land better. There are some pretty glaring mistakes in Black Site. While the movie never quite explains what the Elder Gods are (nor does it have to), the audience does learn they live for an abnormally long time. There is a also the silhouette of an imposing creature shown often. Still, the name seems a little too much for what amounts to monsters that have a long lifespan. The idea of normal humans easily beating gods is silly and a different name would probably have been a better fit. The strangest decisions may have involved the base itself. Theoretically, the soldiers at the base are some of the best in the world. There has to be some kind of skilled involved in taking down Elder Gods, right? Yet, Sam is a new recruit whose one ability is he has a photographic memory. Other than that, he is a liability in any battle. The site is also easily taken over by a group of normal people. Weirdest of all, is the decision by two of the protagonists to communicate over site’s loud speaker for everyone to hear. The movie is redeemed a little by its frantic pacing. Black Site is non stop action. There are moments of exposition to explain the characters and their motivations, but this is a film filled with battles. The tone is set by the music and the flow of the movie seamlessly goes between its main characters. The story draws its audience in and the action keeps them engaged. Black Site is a movie that wears many hats. Part horror, part sci fi, and part action movie, there is a lot that will please fans of different genres. The film would have been better served focusing on a tighter story, the fantasy parts could have been better explained with sci fi, for example. However, the music and tone are great. Despite its flaws, Black Site is a fun movie . 'Black Site' does a lot of things right. The combination of elements is fun, there just may be too much.